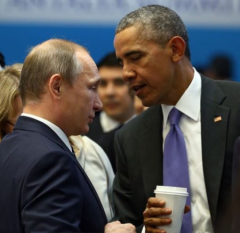 U.S. relations with Russia have run hot and cold for the past ten years. New intelligence shows that relations are coming out of the deep-freeze and entering a new thaw. In March 2009, shortly after the Obama administration first came into office, Hillary Clinton met with Russian Foreign Minister Sergei Lavrov in Geneva. It was her first meeting with Lavrov since Clinton had become secretary of state. Relations between Russia and the United States had been under stress because of Russia’s invasion of Georgia in 2008 during the George W. Bush administration. Obama and Clinton wanted to reset the relationship and move into a less adversarial posture. As a goodwill gesture, Clinton asked her aides to create a large red reset button (similar to the “easy” buttons used in the old Staples advertising campaign) with the word “reset” in Russian. The button was put in a case and presented to Lavrov as a gift at the Geneva summit. There was only one problem. State Department experts used the Russian word “перегрузка” on the button for the English “reset.” Lavrov looked at the gift and politely informed Secretary Clinton thatперегрузка actually means, “overcharge.” Oops. Clinton and Lavrov pushed the button anyway for the cameras. Russian-U.S. relations have been downhill ever since. When Obama and Clinton came into office, the President of Russia was Dmitry Medvedev. At the time, Vladimir Putin was Prime Minister. Putin had been president from May 2000 to May 2008, but was subject to term limits. Medvedev and Putin simply switched roles with Medvedev becoming president and Putin becoming prime minister. Technically this made Medvedev the chief executive and commander-in-chief in Russia. Yet, few doubted that Putin still controlled Russia from his slightly subordinate position. This de facto relationship was confirmed in May 2012 when Putin again assumed the role of president. Medvedev stepped aside and assumed his former role as prime minister. It was a complicated game of musical chairs, which gave Putin the presidency until at least 2020. Nevertheless, Obama and Clinton found Medvedev (who was president in 2009) to be more to their liking than Putin. Medvedev is more diplomatic and has a more global outlook than Putin, who is a staunch Russian nationalist. From 2009 to 2011, Russian – U.S. relations warmed slightly, notwithstanding the red button gaffe. In 2012, Russian-U.S. relations were again strained due to U.S. plans to put an anti-missile shield in Poland. During the 2012 U.S. election cycle, Obama distanced himself further from Russia because he was appealing for ethnic votes from anti-Russian Poles, and other Eastern Europeans living in the U.S. Still, Obama wanted to keep lines of communication open and looked forward to diplomatic deals with Russia. On March 26, 2012, just seven months before the U.S. election, Obama was caught on camera at a summit conference whispering to Medvedev that he would have “more flexibility” after the election. Medvedev promised to pass that message to Putin who was about to replace Medvedev as president. Russian-U.S. relations had another thaw early in 2013 after Obama’s reelection, but it was short-lived. On the night of November 21, 2013, demonstrations broke out in Independence Square (Maidan Nezalezhosti) in Kiev against the Russian-backed government of Viktor Yanukovych. The protests peaked in February 2014. Yanukovych and his cronies fled the Ukraine. Putin suspected that the Maidan protests were secretly funded by the British intelligence agency MI6, and the CIA. In order to secure Russian interests in Ukraine, Putin invaded Crimea, and began supporting anti-Kiev ethnic Russians in eastern Ukraine. In response, the U.S. and its NATO allies imposed harsh economic sanctions on Russia. The sanctions included a ban on major Russian companies (such as Gazprom and Rosneft) refinancing their euro-denominated debt in western capital markets. Since Russian companies could not refinance their debts, they began to draw on central bank hard currency reserves to retire the debt. In turn, this began to deplete Russia’s reserves and force higher interest rates and a devaluation of the ruble. The ruble sank like a stone beginning in March 2014. 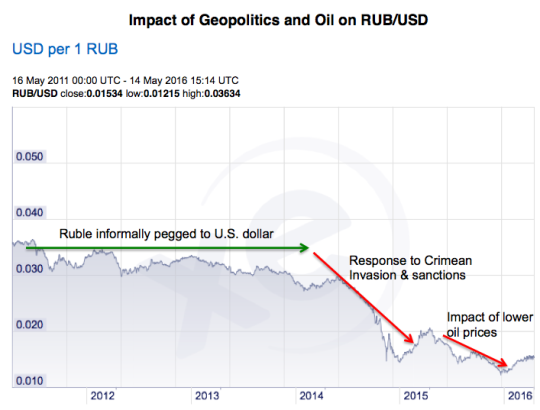 It fell from about 28 rubles to the dollar to 70 rubles to the dollar by early 2015 when relations were at their worst. (On an inverted RUB/USD scale, this fall would be from $0.035 to $0.014). The ruble regained some strength to the 50:1 level ($0.020) when it became clear that the Russian economy, although weakened, was more resilient than U.S. financial warriors had expected. Then Russia got whacked a second time with the collapse in oil prices. This collapse began in mid-2014 around the time of the Ukraine crisis. It reached its most intense phase in mid-2015 when oil fell below $40 per barrel on its way to $29.00 per barrel by early 2016. Russia is the world’s third largest oil producer (after the U.S. and Saudi Arabia), and second largest oil exporter (after Saudi Arabia). The damage to the Russian fiscal situation was immediate and led to a recession in the world’s ninth largest economy. This second blow to the Russia economy pushed the ruble to 81:1 ($.012) by January 2016. The Russian economy was in crisis. Then a confluence of factors emerged to cause a rally in the ruble and a turnaround in the Russian economy. These factors fit smoothly into the analytic methodology. In plain English, the formula says that by updating our initial understanding through unbiased new information, we improve our understanding. I learned this method in the CIA, and have seen it used at top-secret weapons laboratories to solve some of the most difficult problems imaginable. (I can’t say more about these exercises because the discussions were classified). The left side of the equation is our estimate of the probability of an event occurring. New information goes into right hand side of the equation. If it confirms our estimate, it goes into the numerator (which increases the odds of our expected outcome). If it contradicts our estimate, it goes into the denominator (which lowers the odds of our expected outcome). The odds are continually updated as new information arrives. In my premium research service, Rickards’ Intelligence Triggers, we use the same method to find actionable trading recommendations. Current indications are that Russian-U.S. relations are entering a new period of thaw after two years in the deep-freeze. This new era of cooperation between the U.S. and Russia centers mainly on joint efforts by President Obama and President Putin to bring an end to hostilities in Syria, and remove Syrian President Bashar al-Assad from office. President Obama and President Vladimir Putin of Russia have discovered they can do business despite some strong disagreements, and damaged relations on issues such as Crimea and eastern Ukraine. Their main area of cooperation today involves Syria and efforts to remove Syrian President Bashar al-Assad from office. What are the other factors that enter the equation and allow us to estimate the direction of the Russia economy and the ruble with a high degree of confidence? Oil prices are staging a rebound. From a low of $29.00 per barrel, they are now over $40.00 per barrel. This is a major lifeline for Russia. Iran is now open for business after concluding a nuclear deal with the U.S. Many U.S. and European companies are reluctant to reenter the Iranian market because there is still ambiguity about the scope of sanctions relief. Russia has no such reluctance. They are moving ahead with deals in nuclear power, weapons, refineries, and other infrastructure. The cheap ruble actually helped Russian companies keep expenses under control, and convert dollar earnings into more rubles to pay local operating costs. This has bolstered the earnings of major Russian companies. The Central Bank of Russia has been aggressively buying gold with its dollar reserves. This was a brilliant strategy. They bought gold when the dollar was strong and gold prices were near seven-year lows. Now that the dollar is weakening and gold is surging, Russian gold reserves (priced in dollars or SDRs) are going up. Because of the weaker dollar, other commodity prices are rising. Russia is a major exporter of nickel, palladium, iron and timber. U.S. allies, especially Germany and France, are growing tired of the sanctions regime, and are looking for opportunities to get back to business as usual with Russia. In short, all of the factors that were working against Russia from 2014 to 2016 (cheap oil, strong dollar, sanctions, and low commodity prices) are now working in Russia’s favor.